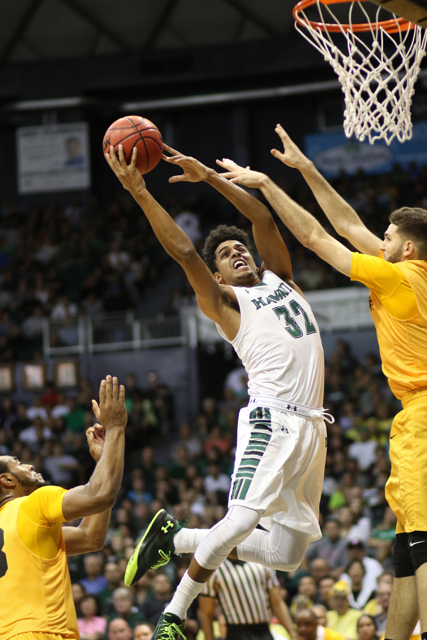 Big West Conference dark horse Long Beach State washed ashore and outplayed Hawai’i in almost every phase of the game Saturday night en route to a stunning 78-64 men’s basketball victory. A sellout crowd of 9,076 at the Stan Sheriff Center watched Nick Faust score a game-high 28 points and grab 14 rebounds, Gabe Levin add 11 points seven rebounds, and Mason Riggins and Travis Hammonds each contribute 10 points as the 49ers improved to 11-12 overall and 5-3 in the Big West, snapping the Rainbow Warriors’ win streak at eight games and dropping them to 16-3, 5-1. 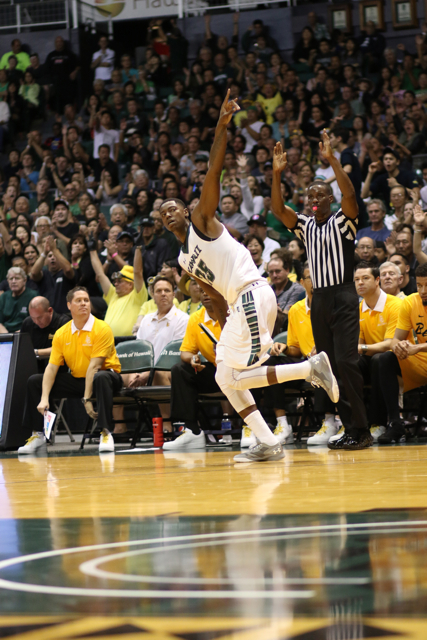 UH remains in second place, a half-game behind leader UC Irvine (6-1). Evidence of Long Beach State’s winning performance was splattered all over the final stat sheet, as the 49ers out-shot the Rainbow Warriors (45.2 percent to 35.2 percent), out-rebounded them (47 to 28) and proved to be deeper (24 points off the bench, compared to 13 for Hawai’i). Mike Thomas scored a career-high 20 points, Quincy Smith added 13 points, four rebounds, four assists and four steals, and Roderick Bobbitt contributed 12 points, five assists and four steals to lead the Warriors, who mounted a furious comeback after trailing 65-55 with 5:27 remaining. Thomas scored a layup to cut it to 66-63 with 3:36 left, but Long Beach State responded with a 12-1 run and won going away. Bobbitt opened the scoring with a 3-pointer, but the 49ers responded with a stunning 16-0 run over the next seven minutes to lead 16-3 with 11:11 remaining in the first half. UH starting post Stefan Jankovic picked up his second foul less than four minutes into the game and was sent to the bench, contributing to the Rainbow Warriors’ offensive drought. “We didn’t come out of the gates well, and it wasn’t just for two minutes — it was more like 10 minutes,” Ganot said. Long Beach State extended the lead to 21-7 on Riggins’ putback wih 8:41 let, and Jankovic returned soon after, scoring a layup to ignite a 9-0 run that closed it to 21-16 with 6:14 remaining. But Riggins scored on another putback to start a 9-0 run for the 49ers, and it was 30-17 after a deep 3-pointer by Faust with 4:55 left. 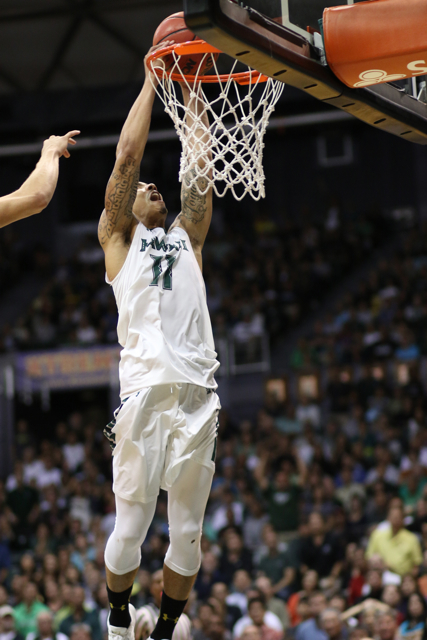 Hawai’i then finished the half with an 11-4 run to close it to 34-31 at the break. The Rainbow Warriors made just 9 of 20 free throws in the first half and were out-rebounded 25-13, including 7-2 off the offensive glass and 18-11 on defense. The 49ers opened the second half with a turnaround jumper by Riggins and Faust’s 3-pointer, making it 39-31 in the first 70 seconds. UH cut it to 41-36 after two free throws by Aaron Valdes with 17:31 remaining, but Faust answered with a layup to start a 7-0 run capped by Hammonds’ putback to put Long Beach State ahead, 48-36, with 14:47 left. The 49ers proceeded to answer every spurt by the Warriors, who could not get closer than six points until Smith made a steal and two-handed fast-break dunk over Noah Blackwell, who fouled Smith at the rim. Smith converted the three-point play, closing it to 66-61 with 4:28 remaining and raising the volume and okole of the sellout crowd. Thomas then scored on a layup to make it 66-63, and the Stanley was rocking. 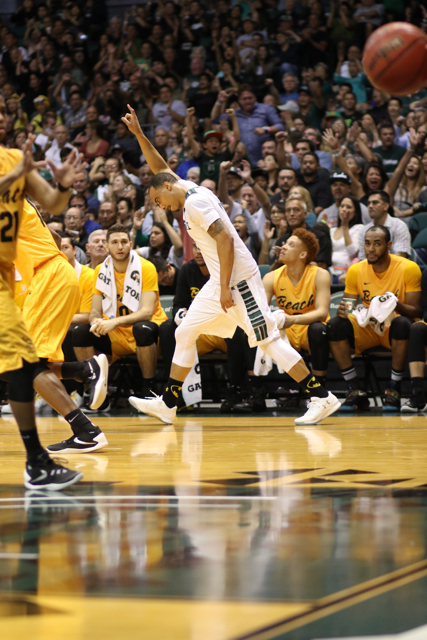 Long Beach State failed to score on its ensuing possession, but Bobbitt missed a long 3-pointer on Hawai’i’s next series and Levins converted two free throws to push the lead to 68-63 with 2:21 left. Bobbitt then missed on another desperation 3-pointer as the shot clock expired, and Levins scored on a jumper in the paint to make it 70-63 with 1:37 remaining. After a Rainbow Warrior turnover, Faust then effectively sealed the victory with a transition 3-pointer to make it 73-63 with 1:17 left. “He was aggressive, he played really hard and he hit open shots,” Thomas said of Faust, who leads the Big West in double-doubles with three. Injuries also hampered UH’s comeback effort, as starting shooting guard Isaac Fleming apparently turned an ankle in the first half and was limited to 17 minutes total, going scoreless for the first time this season. Meanwhile, swingman Valdes, who returned to the court for the first time since suffering a “turf toe” injury in the opening minutes against UC Santa Barbara on Jan. 9, was mostly ineffective (three points, all on free throws in eight attempts, and three rebounds) in 19 total minutes. Also, foul trouble continued to plague Jankovic in the second half, as he picked up his third less than two minutes in and his fourth with 15:30 remaining. Jankovic finished with a season-low six points on 2-for-9 shooting in just 22 minutes. The 64 points was a season-low for the Warriors, who entered the game leading the Big West in scoring offense at 80.4 points per game. The 49ers won despite losing point guard Justin Bibbins to a hamstring injury late in the first half. He entered the game averaging 11.7 points and 5.2 assists per game, but was limited to two points and four assists in 15 minutes before being carried off the court in the first half. The game was officially a sellout, with all 10,300 tickets sold. It was the first sellout for a men’s basketball game since March 2004. Things won’t get much easier for the Warriors, who will travel to games at UC Santa Barbara on Thursday and Cal Poly on Saturday. “…but there is no joy in Mudville — mighty Casey has struck out.” But he’ll be back, we hope. Did the tv catch the argument(s) referred to in the prior posts ? i didn’t see any of it, but thanks for the reports. Today’s newspaper article said Long Beach is not known as a great rebounding team. However, before last night’s game, they were No. 3 in rebounds in conference games af 37.3 avg per game, ahead of UH at 34.6. But for offensive rebounds, they were 7th at 9.4 and UH was 3rd at 10.2.
xer 21, re prior post … Faust leads his team in rebounds for the season. Shake it off bows.. this should make you hungry to work on the things that LBS exploited. Give the game ball to Quincy and move on. I don’t think I have seen a better performance then QS last night. It isn’t all in points scored. Keep it up. “UH is THAT GOOD AT home, and with crowd.. unbeatable.. either that, or any shots LBSU takes, from field or FT/ 3 line, 70 percent or better goes. in.. Once UH turns 49ers over, gets out and runs in second half , build up lead to 14 to 16 points.. IT IS ALL OVER..
OR shoot lights out, from open tip till final buzzer. UCSB game and POLY.. those teams getting confidence. Warriors have to go to WAR ! Quincy, the Art Woolaway Most Inspirational Player of Year award winner right now. What a Warrior. And he can be the MOP award winner too. Plus he is going to GRADUATE.. The guy has great parents, good family, Kendal Smith 6’2″ 195 lb brother plays for CSUN.. bet the Smith Ohana will be watching that battle.. We knew it since Gib first brought in Quincy.. he AND Nevels were great gets.. good young men..BOTH WARRIORS>. Incorrect, Long Beach St. did even better without Bibbins playing. Had 9 TO’s in the 1st half, only 6 in the 2nd. Shot a better % in the 2nd half, except for FT %. 2 steals in 1st half, 3 in the 2nd. And Long Beach St. created trouble for UH when LBSU pressed UH. Being out rebounded overwhelmingly cost us the game. It was non existent. What a let down. The Warriors need to learn from last night. Onward to some tough road games this week. Can’t repeat this lack of performing offensively and defensively. Come on Warriors ! as Ganot and team said , quite candidly, LBSU just outplayed them in all regards. love the competition.. NOT a two team league.. it is 8 teams going for the Dance ! The minions were impressive with the coordinated hand motions, etc. like at about 4:36 of the video above, with Jamie leading them. I didn’t see all the arguments but I agree that Janks committed a stupid 4th foul. Maybe Bobbitt could have said something and leave it at that. No sense, going on when Janks probably knew that was stupid. As for Valdes with the coach, I don’t know what that was about but Valdes wasn’t contributing so it’s too bad Fleming got hurt. I also thought Sai had a terrible game. I also saw the team kind of give up at the very end and Faust was a jerk. On the positive side, the stats don’t show it but what a game Q had. Very inspirational. Free throws haunting this team. When your overall game suffering at least free throws can keep you in the game. And Isaac not in the game at crunch time did not give us any chance to pull it out. But silver lining goes to Thomas and Smith. They are bringing it as the season approaches conference championship. Good time to blossom and peak and start another winning streak. 3)run into teams in conference scout them well and now can beat them.. Still 3 or 4 losses in conference can benefit team..
Valdes is fine physically. being mentally rusty has nothing to do with his toe. people with turf toe dont throw up 360 dunks in the shootaround. Faust leads his team in rebounds because LBSU has no real inside presence and none of their bigs play consistent minutes. He’s the leading rebounder by default on a team that is fairly average on the glass because he’s their biggest guard and he plays the most minutes. We lost our focus. I think it was pretty clear that we we came out expecting a win and were looking ahead to the Irvine game. Too much hype on that around the league, and I think it bit Irvine too as they lost to UCSB at home in similar fashion to us. No excuse for such low effort on the glass, Just gotta sit down, recollect ourselves, and maintain our focus on the present next time. Long Beach is now 2nd in rebounds per game, 38.5, in CONFERENCE games, behind UCSB’s 39. Prior to the UH game, they were 3rd. UH is now 6th at 33.5 rb per game. The eye test tell me they have strong rebounders, Levin, Hammonds, Prince, Faust, etc. Faust had 14 rebounds vs UH and is 6th or 7th in the Big West for conference games at 7.1 average. Mike Thomas is 1st at 7.7, so far. UCSB is UH’s next opponent. They had 20 assists to only 8 TO’s vs Irvine, 9 steals to 3 for Irvine. Irvine had 9 assists to 15 TO’s and 3 steals. Rebounds and blocks were about the same for each team. Levin is 14th at 6.0 reb per game, Hammonds 18th at 4.6, behind Faust at 7.1 reb per game and they have NINE in the top 50 rebounds per game players for conference games. UH has five players in the top 50 rebounders. we only have 5 in the top 50 because we have a shorter rotation. LBSU splits the time on their bigs much more than we do. LBSU, per the eye test, didnt do anything special to rebound. they get a lot of long rebounds because they’re a jump shooting team (which helps their guards’ numbers a bit), and they dont really block out. the reality is is that we gave away a lot of easy rebounds. LBSU was catching rebounds really low, that is, they were not attacking the glass so much as just waiting for free rebounds that we put no effort into chasing down. yeah, the followed up some of their shots on the offensive glass, but a huge chunk of the rebounds were totally uncontested. Ganot gotta punish these boys in practice for their lack luster effort make them run,run,run I guarantee you the next game the effort will be there win lose or draw. xer21 I agree LBSU did nothing special to rebound. xer 21… LBSU Ranking 2nd in Big West conference games in rebounds means something. Even if they spread the rebounds out over say 9 players, they get MORE TOTAL rebounds that anybody else in conference play except UCSB, who is our next opponent. The goal is to get more rebounds and it does not matter how the rebounds are spread out among the roster. They had 14 more defensive rebounds than UH had and 5 more offensive. Also, their nine top rebounders include five guards. Faust is 6-6 and can get up there on the boards. Our five top rebounders include 2 guards. Missing in the stats is 6-5 Aaron Valdes because he missed 3 games and hardly played in the game he was first injured. nice comments.. analysis.. REAL CONCERN.. BWC teams are getting better too.. Now know how to slow down UH, defend them, frustrate them..
Man to Man and mix up zone, have guys not usually the leading scorers be the key guys. Get the core guys in foul trouble. And MOST CONCERNING as bigdaddy alluded to. .. THERE is a communication, coaching, team morale/ same page problem with Ganot’s team, very evident, when never happened until UH was behind by 10 points and trying to catch LBSU.. the chirping, the cussing, the battles with coach, who goes in and who doesn’t.. man if it sounds like last year.. ? well it is the same guys.. different coach. as bigdaddy says.. Ganot has to earn his pay.. get team on Board. fast, or else, UH could lose some games in next 10,.. remember UH plays their last 10 BWC regular season games on the ROAD. the BWC teams.. feel they can beat UH.. at home or at SSC,.. UH gotta wake up quick..
Apologize, CORRECT my BWC schedule , statement.. UH plays the last 10 games of BWC regular season 6 out of 10 on the road.. This team was outrebounded, shot bad at the stripe, missed lay-ins, and failed to block out. Many of the rebounds for the Beach were on the offensive side that resulted in a second and third try finally resulting in a basket. I predict that this loss will result in a bad tail spin for the team who will lose 2 of the next 3 games. Whether it be injuries, in-fighting amongst player or with coaches. Speaking of coaching – One thing is for sure, none of this years’ juniors will remain after this season. Fleming will red shirt and go to a mid-major or even a high major. It wouldn’t surprise me if recruit Bowies and Buggs non-commit to the program. Don’t get me wrong, Donate $K’s to the program. One bad game and some random dude shows up to make some absolutely ridiculous assumptions. LOL. Do you even watch sports? Or this team at all? Longer than you. That’s for sure. I have been on this site for a long time and only recently have seen you posting comments here. Talk about random dude. Let’s revisit this come Sunday after the road games. Watch this team at all? Season bball ticket holder for over 25 years. Is that long enough? Ah c’mon!